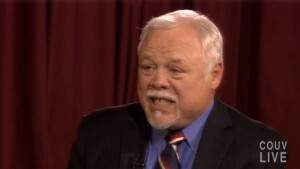 Don Benton (R) State Senate, 17th | Audio and video stories from Southwest Washington. Elected Experience: Don Benton is our State Senator and the ranking Republican on the Financial Institutions, Housing and Insurance Committee and a member of the Government Operations, Tribal Relations and Elections Committee. Other Professional Experience: Don owns the Benton Group, which helps local TV stations succeed. Community Service: Don and his wife Mary are active in our local community. Don is an Assistant Scout Master for the Boy Scouts, serves on the board of the Wolverton Mountain Gun Club and previously served on the board of the Clark County Red Cross. The family attends the First Church of God. Statement: Don Benton is a small business owner, married 30 years, father of four, Scout leader and one of our state’s most principled elected leaders. He has a record of working across party lines to promote jobs, defend our public schools and balance the state budget. Benton knows that limited government is vital to our prosperity and liberty. As the 2012 session neared the end it was clear the majority party simply could not pass a budget. This is when Senator Benton helped advance a bi-partisan budget that balanced without tax increases or gimmicks – ultimately breaking the log jam that had paralyzed Olympia, and leading to major reforms in our government. He voted to make education the number one priority in the state budget. As a small business owner, Don knows that only people create jobs, not big government. He has voted to ease costly regulations and bring good-paying jobs to our community. Benton has a record of working with leaders from both parties to pass important legislation, including a law that protects children from sexual predators. He defended voter approved limits on tax hikes. Don is honored to represent you and humbly asks for your vote again.